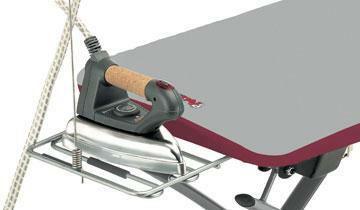 Ironing board with warming, suctioning and blowing functions. 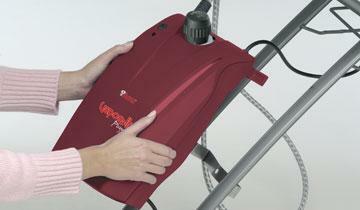 Vaporella Power System is the professional board that makes ironing easier. Combining an integrated steam iron and three specific functions for heating, suctioning and blowing fabrics, this board is a complete and functional ally to get perfect ironing results in a very short time. 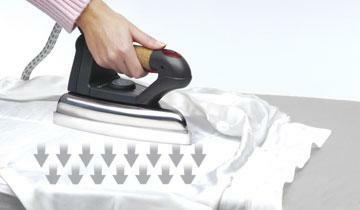 Its integrated steam generator iron is a "traditional" Vaporella with aluminium soleplate, cork handle and safety cap. It has a heating function to quickly dry fabrics, a suctioning function to hold them to the board and prevent creases being made and a blowing function to gently steam iron the lightest fabrics without even pressing. In addition, the Vaporella Power System has a cord holder and a laundry shelf to keep everything in the right place and iron even quicker. Two convenient wheels allow easy transportation to and from the storage cupboard and the closed board is only 30 cm deep. Everything within reach for easy and high-quality ironing. The board is equipped with an integrated and easily removable steam generator iron: a real "traditional" Vaporella with aluminium soleplate, holes concentrated at the tip of the iron, cork handle and safety cap. 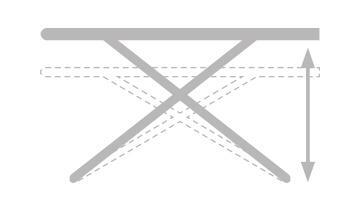 Several fuctions to deal with specific ironing needs. Blowing to gently lift light fabrics, suctioning to hold them to the work surface and prevent accidental creases, heating to favour the drying process. The board has a height adjustment system to get the most comfortable working position for your needs. Whether you iron standing or sitting you can make it the ideal working height. 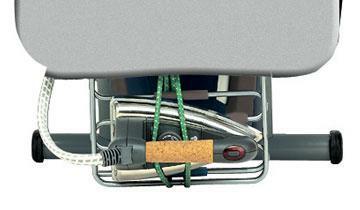 Thanks to the iron rest, flexible cable-holder and laundry shelf everything will be tidy while ironing: the iron near the work surface and the steam cable, and the power supply cable of the steam generator iron with boiler won't get in the way. Not only is ironing easier, so is storage. The two handy carrying wheels let you push it over the floor without lifting.